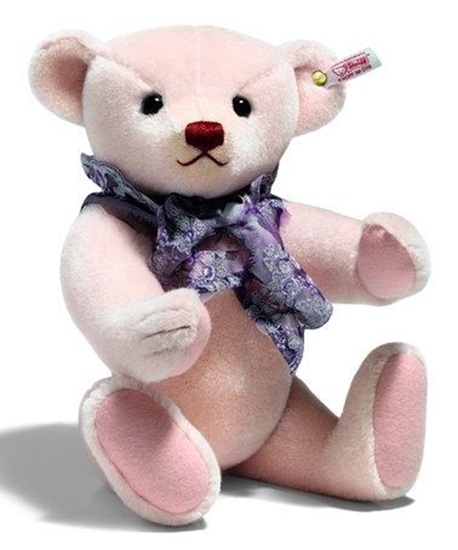 Made from a soft, pale pink alpaca, this is the 2013 Steiff Club Teddy Bear.. Created specifically for Steiff Club Members in 2013, Louise is a breathtaking sight to behold. She is made from a soft, pale pink alpaca, and stuffed with a synthetic filling. She has black safety eyes, and a deep wine red hand stitched nose and mouth. A beautifully embroidered purple scarf is tied in a bow around her neck. She is 13 inches tall, fully jointed, and surface washable. She comes with the white tag "Button in Ear" with the elephant motif.